Burns, Oregon—Stretching across 188,000 acres of low-slung scrubland in southeastern Oregon, the Malheur National Wildlife Refuge is home to more than 320 species of birds and, as of this writing, an armed group of self-styled militiamen. 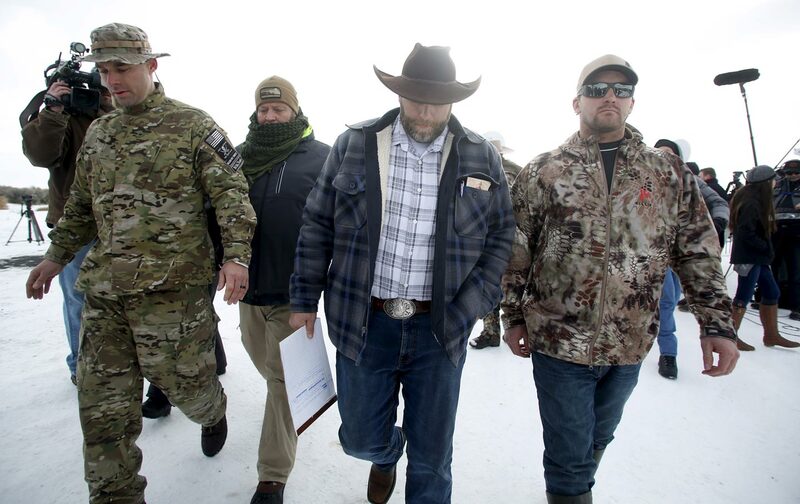 The men took over the refuge’s headquarters on Saturday evening to protest the arrest of two local ranchers and the tyranny of the federal government. An Arizona cattleman named LaVoy Finicum told me that he and his fellow militants were greeted on arrival by a bald eagle, which spread its wings and took off from a fence post in an indubitable symbol of American freedom. There were few birds, certainly no eagles, soaring above the compound on Sunday afternoon—just a flock of journalists hanging around the entrance of the occupied area, stamping their feet in the snow. “We hear there’s tyranny going on in Hawaii,” joked a “patriot” in camo gear who was guarding the road down to the government buildings. A few other men sat in pickups or stood around a fire that gave off more smoke than heat. Now and then a figure could be seen up in a watchtower overlooking the compound. Nobody is sure what they’re doing out there, not the journalists or the locals or even some of the militants. A tour of the compound on Sunday afternoon suggested a much smaller force than Ammon Bundy boasted of, made up of gruff militiamen and amiable ranchers from out of town with pocket Constitutions and “the God thread running hard through them,” as one put it. Though the media reported a “standoff,” there was nobody there for the militants to stand off against—no police, no federal agents apparent anywhere on the stretch between the refuge and the town of Burns, population 2,800. Nobody is totally sure what they’re doing out there, not the journalists or the locals or even some of the militants, who came ostensibly to defend Dwight and Steve Hammond, a father and son who turned themselves in to a California prison on Monday to serve five-year sentences for setting fire to federally managed land near their cattle ranch. But the Hammonds didn’t ask for an occupation in their name. According to the local sheriff, Bundy and company are not there to help the ranchers but instead “to overthrow the county and federal government in hopes to spark a movement across the United States.” The “movement” isn’t new: Bundy is escalating a decades-long conflict over public lands in the West—a conflict that spans the Sagebrush Rebellion in the late 1970s and recent standoffs at mines in Oregon and Montana. In Burns, the courthouse and the offices of the Forest Service and the BLM were shut Monday. The schools are closed for the entire week out of fears of violence, forcing some parents to stay home from work. One woman, who identified herself only as Jen, brought her sons out to Malheur on Monday to see firsthand what prompted the school closures. She said that the families of some local police officers have fled town. “This is starting to divide the community,” she said. I heard a similar sentiment on Sunday at Central Pastime, a bar in Burns decorated with a National Rifle Association clock and the stuffed head of a wild boar. The bartender, who ended up in Burns two decades ago after pointing blindly to it on a map of Oregon, wasn’t shy about expressing her low opinion of Bundy, though she generally supports militias. But others in town are worried about losing friends and customers if they pick the wrong side in the conflict, she said. The only event in Burns remotely comparable to what’s happening now was when members of the Animal Liberation Front burned down a BLM facility used to hold wild horses in 1997. The lines of loyalty are far messier now: there’s little love for the federal government, but many residents work for the BLM, Fish and Wildlife, and other agencies. People are troubled by what’s happened to Hammonds, but equally so by the group of armed strangers camped out at the bird sanctuary. Less than 8,000 people live in Harney County, which covers some 10,000 square miles, making it one of the least populated and largest counties in the United States. With more than 21 percent of residents living in poverty, Ammon Bundy is preying on real grievances. Seventy-five percent of county land is public; Bundy argues the government unconstitutionally seized the land from the state, and that the area’s economic woes could be solved by turning it over to local control. Like much of rural Oregon, Harney County is conservative—in 2012, 72 percent of county voters supported Mitt Romney—and many residents I talked to were generally sympathetic to the argument that environment regulation is choking out the agricultural and timber industries. Yet most are skeptical of Bundy’s tactics. “The lady that cleans the refuge—she’s out of a job,” pointed out a former BLM employee who was playing a lottery game at Central Pastime. “Everybody’s shut down. It’s really unfortunate that somebody’s agenda is bigger than the whole community.” As of Monday, according to Bundy himself, no locals had joined the occupation. The Hammond family has clashed with federal authorities over control of federally managed lands for decades. Their ranch covers 12,000 acres between the Malheur reserve and the Steen Mountains; before the arson convictions they leased an additional 26,000 acres of public land for cattle grazing. Dwight Hammond was convicted of interfering with use of public land after a run-in with hunters on BLM land in 1999, and he was arrested in 1994 over a water dispute on the refuge now occupied by Bundy’s group. At the time, a Fish and Wildlife agent wrote in an affidavit that the rancher had previously threatened to kill two officials there. The Hammonds were indicted for arson in 2010, for two fires set on federal land in 2001 and 2006, and sentenced under a federal antiterrorism statute carrying a five-year mandatory minimum. But Dwight and Steve served only three months and one year, respectively, because the judge felt a longer term “would shock the conscience.” After they’d finished their prison time and gone back to ranching, the US Attorney in Oregon challenged the judge’s order, which was then overturned. The Hammonds faced a second sentencing and were ordered to return to prison. Cowboys in earmuffs giving a lecture on states’ rights at a frozen bird sanctuary would be little more than a nuisance if they weren’t armed. As one militia member remarked as he led a few reporters onto the compound Sunday afternoon, the Bundy group needs the media—for protection, he said, but also in order for anyone to take them seriously. I heard one militant leader ask another to stop talking to the press because he seemed drunk. A few others declined to speak with me in order to ensure a “unified statement.” After the threat of violence drew the TV trucks, there was a marked shift in tone at the compound. Men who’d worn their guns openly on Sunday appeared unarmed at Monday’s press tour, during which Ammon Bundy, wearing a neat flannel shirt that brought out the blue of his eyes, downplayed the possibility of a clash with law enforcement and tried to reassure the community of his group’s intentions. Besides celebrity, the militants’ goals are somewhat obscure. Bundy initially said he intended to remake the wildlife refuge into a “base place” for “patriots from all over the country,” and was planning to stay there “for years.” LaVoy Finicum said Sunday that he would stay until all of the people in the county who had land disputes with the federal government were given deeds to the property in question. Bundy seemed to echo this goal on Monday, saying his group would “go to work” to “unwind unconstitutional land transactions.” He also demanded that an “evidentiary hearing board” be established to reexamine the Hammond case. But on Monday evening, Ryan Bundy said the occupation would end if the community doesn’t support it. One member of the militia had told me that decisions are made by group consensus, but Ryan Bundy’s announcement reportedly came as something of a surprise to other members. Harney County Sheriff David Ward issued a blunt directive to the militants on Monday afternoon: “Go home.” That’s been the only direct response from law enforcement so far. Critics have pointed out the mismatch between the restraint shown towards this armed rebellion, led by white men, and the militarized response to protesters in Ferguson, Missouri, or people of color more generally, people like Tamir Rice. It’s a fine observation, but not a good argument for a dramatic police raid on the compound, which would only bear out the militants’ claims that the government is out to kill them. Of course the Bundy family’s repeated evasion of their dues to the American taxpayers, and the emboldening of armed anti-government militia groups since the election of Barack Obama, deserve attention. So does the plight of rural communities like the one around Burns—that’s the story least likely to be told by the fistful of journalists waiting out in the cold.